Description: Attractive and rare map of Durham embellished with ships and with a large dedication to Sir Francis Radcliffe. Description: Decorative and early county map of Durham, divided into wards. Coloured. 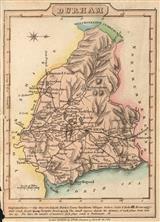 Description: County map with borders illustrating local antiquities and Roman inscriptions. Original colour. Description: Durham county map. Taken form Bowen's Large English Atlas. Numerous sections of descriptive text surround the map. Original colour. Description: Elegant county map of Durham noting major roads and settlements. Original colour. Description: Beautiful example of Georgian Durham with an extensive road network and wonderful topographical detail. Original colour. Description: Attractive county map of Durham divided into wards. Original colour. Description: Durham, a detailed and attractive county map published in the early 19th Century. Original colour. Description: Attractive map of Durham highlighting the developing road network during the Industrial Revolution. Original hand colour. Description: Miniature county map of Durham with charming detail including small figures denoting the distance of each place from London. Original colour. Description: Durham, divided into hundreds and with vignette of Sunderland Bridge. Original colour. Description: Durham. Large, striking county map with a vignette of Durham Cathedral. With an inset of Durham exclaves located within Northumberland, also an inset of Easingwold, Yorkshire, formerly Durham. Original colour. Description: Colourful county map of Durham. Major roads are marked with blue lines and planned railways with red lines. Original hand-colour. Description: Charming county map, coloured and surrounded with a decorative border and beautiful vignettes.